The final week of the excavations at the Palace saw resolution of some of the questions that arose in the earlier weeks but there were still surprises in store. At the beginning of the week it was not clear whether the broken floor tiles in the trench to the south east of the vault building were in situ or merely part of a dump of demolition material from the 1620s. 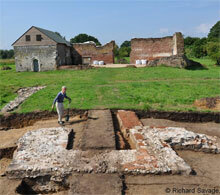 Continuing excavation showed not only that they had been part of an in-situ floor, with the tiles forming a chequer-board pattern later damaged by tree roots, but that they were contained within substantial wall foundations made of brick. The survival of these tiles and indeed the wall foundations is probably due to their having been covered by a 17th century field-bank created on the conversion of this part of the site into a farmyard. Very late in the excavation it was discovered that the massive masonry foundations of the south wall of the Great Hall had apparently been constructed on a double row of great timber piles driven down into the natural sand of the area. It was not possible in the time available to arrange for these piles to be dated by dendro-chronology; they have been left in place for further investigation in due course. 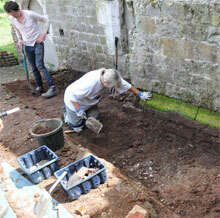 A new trench was opened between the vault building and the building known as the King’s Hall to reveal the base of the north wall of the vault building and the previously hidden south wall of the King’s Hall. 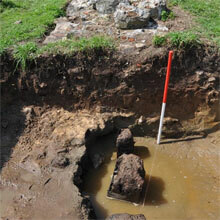 This showed that the large stone ‘buttress’ visible against the north wall of the vault building, thought to be a chimney-stack, is later than the original vault building. Included in the demolition rubble in the trench were many pieces of a lightweight ‘ash’ floor that presumably formed the first floor of the King’s Hall building. 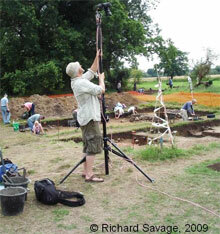 One of the major activities during the course of this final week was the completion of the full archaeological recording of the site by Giles Pattison. Excavation inevitably destroys evidence as it teases out the story of a site and careful recording of all the evidence found is a critical part of the archaeological process. In addition to the traditional method of drawing plans and elevations using a level to obtain accurate positions in relation to the site grid and the Ordnance survey maps, a photographic record was also made. In order to obtain bird’s eye views of the trenches the camera was raised up on a special tripod that took it to heights of up to four metres. A number of official visitors were taken around the site, including local newspaper reporters and the SCC communications department who interviewed professional archaeologists and volunteers working on the site for a video to be made of the project. Watch the video (external website). An important element for all those involved in the excavations was the communication of the developing thoughts of the Director as he studied the evidence being produced by the volunteers in the trenches and the finds processing team. As in previous weeks, on the final day of third week Rob Poulton gave a tour of the various trenches on the site but on this final day of the excavations the tour was preceded by a brief talk at the final tea break where he thanked all those who had participated and in particular those who had worked outside the trenches providing the support necessary behind the scenes to run the dig. This included thanks to the team from the Friends of Woking Palace, led by Jean Follett and assisted by Muriel Tuckey, who ensured that the much appreciated refreshments were available at the breaks and to Richard and Pamela Savage who had worked tirelessly to ensure that all the logistics for the dig to function smoothly were in place.